Help me raise $50,000 for Charity! Click the center picture to see information on the charities. Donations can be made by via Pay Pal/Credit Card or send a check by mail. Click below for mailing instructions. Click the "donate" to learn more about the charities, or the picture to see pictures of the event. 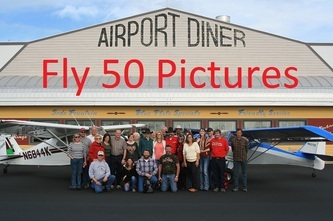 In order to help promote aviation, raise money for charity, and celebrate my amazing first 50 years, I, Levi B. Noguess, made 50 flights in 26 different aircraft on my 50th birthday. This was the kick off for my fundraising effort to raise 50 thousand dollars for charity! Voted the coolest of the day! This Nanchang CJ-6 belongs to Barrington Miles. He and I have been trying to get together for several years for me to get a flight in the "CHANG" and what a fiting time to finally fly it. Of course Miles and the Chang were the stars of the show Saturday. Thanks Miles! for 50 flights in one day! Thanks to all the pilots who let me fly your planes! Click on the picture above to see all the planes! The airplane above is a Kolb Mark III. It belongs to a great friend and it's a blast to fly! You read it right! With your help, I intend to raise 50 thousand dollars for two charities! After all what is a life worth? It all started with the little painting of a Cowboy riding a caricature of my Clipper. It was painted on the tail when I got it. Although it wasn't intended to represent me, many folks thought it did. I took a picture of that cowboy logo to an an Airforce friend in Afganistan and asked him to draw a few sketches to represent my project. I told him to start with the cowboy. He drew them out on scratch paper while on break from his mission in Afghanistan. I was really impressed. I took his final drawing and had a patch made at the local embrodiery shop in Kandahar, Afghanistan. I then contacted Dennis McClain who draws the "BARNTOONS" for Barnstormers.com. He agreed to help me with some more ideas and the Fifty Airplanes in one Day logo was born. Dennis is continueing to help me with more drawings and you will see them on this site. Thank you Dennis, and John for your help!